but also of all those who love the real stories at the heart of History. A new project has been realized: this time it’s a book, telling the entire story of the Maison, the people who built it and those who made it into one of the most popular and highly coveted watch brands. As a volume it is both a tribute and an opportunity to retrace and celebrate an extraordinary epic of entrepreneurship, family and industry, exploring three adventurous plots closely intertwined with the "great history" of the 20th century. All this is recounted by the skilful pen of Giosuè Boetto Cohen. Furthermore, in collaboration with Aurora, a long-standing and prestigious company, among the most renowned manufacturers of writing instruments, Eberhard & Co. realized a special edition of the “Demonstrator”, limited to 130 pieces with a minimal-chic design, a fascinating balance of essentiality and style. 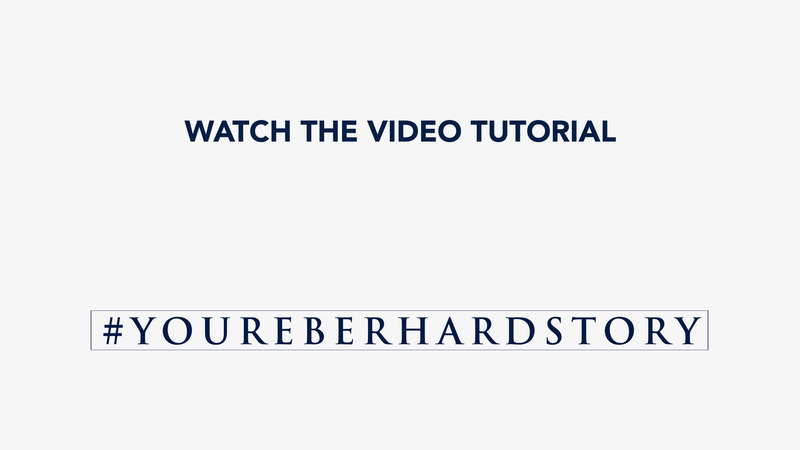 Be part of the Maison’s history and tell your personal story with your Eberhard & Co. watch. your emotions and be part of the Maison's history. Upload the image of your watch and select your favourite font for the text. • I authorise EBERHARD & Co. and subsidiaries to process my personal data for the purposes of sending communications (via email, fax, postal mail, SMS and MMS) of an informative or commercial nature, advertising material, newsletters and promotions relating to the activities, products and services offered by EBERHARD & Co.
Users have to register on the site www.eberhard-co-watches.ch and are required to tell their experience and personal story with their Eberhard & Co. watch ( so if they got the watch from a parent, or it was a gift received on a special occasion, or a personal purchase, and so on…); they have to describe it in a few words and upload an image of their Eberhard watch. Contributions will be collected in an e-book published on the Eberhard & Co. website and shared on social networks. There are no theme or interpretation constraints, with the exception of images depicting watches of other brands. Images with insulting or offensive content, or which offend public decency or the law will not be accepted. For these reasons, the content will only be published after approval by Eberhard & Co.
By uploading their contributions, users consent to the treatment of their personal data. All data provided to Eberhard & Co. shall be treated according to the Federal Law on Data Protection (LPD). The personal data are intended for the exclusive use of Eberhard & Co. and shall not be disclosed to third parties. Eberhard & Co. reserves the right to ask the users for any documents required to verify the correctness of the data and the contribution sent. claim made by third parties. Contributions must not contain any material having the nature or purpose of direct, indirect or subliminal advertising or that may damage the personal or property rights of third parties or that infringe on rules and regulations. Eberhard & Co. or third parties appointed by it reserve the right, subject to the terms deemed most appropriate and in compliance with applicable laws, to limit and prevent any initiative designed to circumvent the system. Any disputes concerning the application of this Rule and/or the Competition that cannot be resolved amicably shall be submitted to the exclusive competence of the Court of Lugano with the application of Swiss law.